his mare was purchased by Black and Blue Quarter Horses at the third Best of The Remudas Sale held in the fall of 2003 at the Stuart Ranch located in Waurika, Oklahoma. She is a full sister to Four 976 and is every bit as good. We are very proud to own both of these mares which were bred and raised by Haythorn Land and Cattle Co. in Ogallala, Nebraska. 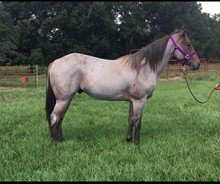 This mare is as gentle as they come and she looks fabulous. She won the Waldo Haythorn Futurity on Labor Day weekend in 2006. To win she had to compete in reining , cutting , roping and halter.